After finishing my "secret project" I decided to use 108" fabric for the back of the "secret project." Off to the Quilt Foundry, my LQS. I know Lisa carries several bolts of 108" fabrics and I was hopeful she had something that would work. The street and parking lot was full of cars so I knew something fun was going on inside. Little did I know I'd have my socks blown off!!! Lisa, the owner, and 10 or 12 other gals were in the middle of a class with Sue Wilson, Certified Instructor for Judy Niemeyer Quilting. The class project was Sunflower Illusions. If I had seen all these paper patterns before the class I would have instantly said, "no way I could manage to do that." Watching all those women working on their Sunflower Illusions were absolutely amazing. While I was admiring every one's choice of fabric (100% true) you know the one that drew me over quickly....yep...the one with Kaffe Fassett fabrics. I was careful not to allow myself to drool on the block...some how I don't think they girls would have appreciated my saliva on their work. Sue Wilson, the teacher, was so sweet...she let me look at her samples and even held up one for me to photograph. She was patient too....lol....because you know I wanted to watch what she was doing too. Sue had 30 pieces of fabric in a stack and she cut them all out at one time. I've never seen anyone do that before so I was very impressed. Talk about wild....all those pieces cut and ready to go! Sue told me that Judy Niemeyer has her own methods of doing foundation paper piecing and the process certainly looked much more manageable that I had imagined. Yep...I got my 108" backing fabric....but I also left with a fascination for foundation paper piecing AND regret for not having signed up for that class. But that doesn't mean I won't be looking up another class soon. It seems like every time I turn around there is another birthday, wedding, shower or some life event where I want to give something personal....something that I have made. Both of my brothers have birthday's in April and my sister and mother have birthday's in May. That's just my family...not my husbands or my own family. Do you ever feel like you had a list of fun things to make and give on those special days? I've had the pleasure of reviewing Quilted Gifts from your Scraps & Stash for House of White Birches and this book is just the ticket for those special occasions. There are a lot of gift project books out there and I've had the pleasure of reviewing a few on my blog. I'd add this book to the list of "great project books" because of the variety of projects included. There are projects for all folks...men, women and children. Check out these fun coasters. "Charming Coasters" are a beginners level project with good directions as well as diagrams. I have to say these are some of the most cheerful coasters I've seen in a long time. Although these are really cute....I can see them being made for both of my brothers depending on the fabric I would choose. The "Mini Dresden Ornament" is another project that I really loved. We all have those holiday gift exchanges in our guilds or families. I can see this being done in any number of different fabrics and given as a wonderful gift. This is one of those hand projects that you can have sitting next to your chair or in the car. By the end of the year you could probably have 4 or 5 done easily and they would be there when you needed a lovely gift. I can easily see this being made in any seasonal fabrics and used over a door handle as decoration. "Wild Goose Chase Wallet" is a 10 hour project. Who couldn't use one of these? I carry a purse but I can think of many occasions where I just want to take a wallet and this would be perfect for those times. Call me corny...if you want to....but I have always loved receiving hand made pot holders. "Jolly Santa Pot Holder is a perfect project for those who have never done any applique and want a small project when learning. Just try and tell me you would not smile if someone made one of these for you (given you are a Christian who celebrates Christmas of course). "Pathways Prayer Shawl" also grabbed my attention. Recently I was at an evening baseball game and it was cold outside. Several folks had big blankets with them. 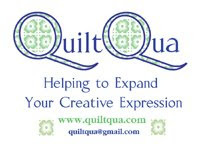 How about a quilted shawl to keep you warm during those events? That certainly is more "me" than a big ole blanket. Talk about a wonderful gift....even for yourself! What about giving someone one of these instead of a whole quilt? It's like a bed runner but it's a "shoulder runner" LOL. "Button Checkerboard" is another one of those really neat ideas to give as a gift. Nothing says you can't make it a chess board too. I've only show you 7 of the 40 projects included in Quilted Gifts from your Scraps & Stash. Yes...I said 40...four zero!!! The book is only $19.95....that is only 50 cents per project/pattern. Now I'd certainly say this is a bargain. The projects are lovely....you know I wouldn't say they were if they weren't....I don't embellish or lie just to get folks to buy a book....y'all know me better than that. Speaking of knowing me better than that....I've been a bit quiet lately. I've been making a secret project that I'm excited about. Can't blog about it until after it is given away....the person who it is for just might see the post so I'm keeping it under wraps for another week at least. My brother, Cordie, turned 50 this week. EKKKKKK....you know what that means....I'm next!! For now, I'll put that out of my thoughts and show you some of his birthday gifts. Yes of course it is a red kitchen towel that says, Gone Fishin' :) Who do you think taught me to fish? Yep, you guessed it, Cordie did. When you think the world is too complicated and everything is going to hates in a hand basket....remember my brother, Cordie and you will smile...a wide happy smile...I promise. My sister, Tracy is on the left and my brother, Cordie is on the right. I've already shared about Tracy...let me tell you a little about Cordie...something other than he's 50 now....I can't believe he is 50...blows my mind. Cordie is discovering "sniping" in this photo.....he was tickled beyond belief and almost burst with joy after "snyping" with his two sons. He has not seen his boys in a few years although he talks to them every few days. This is the first time he has ever been able to see them....and yes he was using Skype....ROFL. He had never heard of Skype and had no idea what that was all about and I'm telling you I think it was absolutely the best thing he could have gotten for his birthday....the joy of seeing his sons. I must say it was a heart warming treat for all of us. When he opened his gifts he held them....examined them....and beamed with joy. That's why I love making things for him....he just treasures them. I apologize for the wait but several folks had computer problems and I wanted to be sure I had the opportunity to list everyone who wanted to contribute a prize to the Bling Your Thing Challenge. 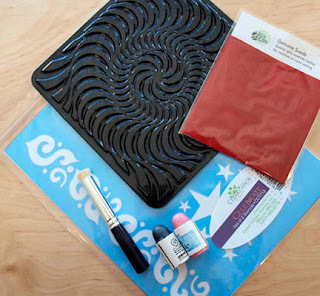 A very cool way to Bling Your Things with 2 mini Paintstiks, a set of Celebrate Stencils, a Rubbing Plate, a suede square and a Brush. I'm sure many of you already know Shelly Stokes from Cedar Canyon Textiles, but have you seen some the amazing projects she has been working on lately? Her blog is full of really fun ways to Bling almost anything! Shelly even has a new book out, Rubbing Plate Roundup....check it out....I have and it is excellent! 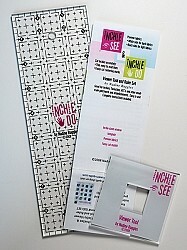 InchieSee & InchieDo Viewer Tool and Ruler Set too. How cool is that? I'm so excited for who ever wins because making Inchies is so much fun and a wonderful way to "Bling Something"!! The Tool and Ruler Set is just what you need to make planning and cutting Inchies easy! Use the double-sided InchieSee Viewer Tool with the Inchie-sized window to preview light or dark fabrics for Inchies or to fussy cut motifs. The InchieDo Ruler has very thin lines, open intersections and fussy cut centering marks to make it easy to keep your Inchies on the "straight and square." Great for Inchies, Twinchies, ATC's and other small scale patchwork and embellishments. Easy to use! Complete instructions and tips included! The IHAN contribution to the Prizes are some of my favorite Bling Things and a book to help the winner explore more ways to explore making Bling, Enchanted Adornments by Cynthia Thornton. There are two spools of Wonderfil Dazzle Thread, two packages of Bead Gravy, Beading Thread by Nifty Notions, Rhinestones by Guterman, some Frieze Thread and a few peacock feathers too. Just some fun things I thought someone would enjoy. THANK YOU: Mary, Gene, Karin, Diane, Jean F., Colby, Mary Grace, Lisa, Beth, Jackie, Allie, Sandra, Janet, Jean O., and Bern. Then I drew out one name and paired it with a prize so there would be a total of 4 opportunities to win. Y'all know me....got to spread the fun stuff all around. Congratulations Allie, you have won the Professional Touch Rhinestone Applicator and Crystals from Kandi Corp.
Congratulations Beth, you have won Inchie Quilts and InchieSee & InchieDo Viewer Tool and Ruler Set from Dream Weaver Quilts. 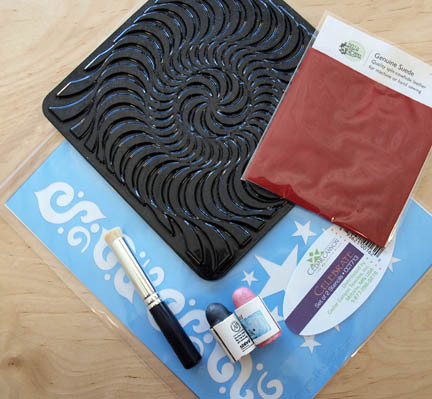 Congratulations Colby, you have won the Paintstiks Kit with stencils, a rubbing plate, a brush and suede from Cedar Canyon Textiles. Congratulations Mary Grace, you have won the IHAN gift assortment. Now all you have to do to claim your prize is to send an e-mail to IHaveANotion@yahoo.com with your full name, address and phone number. "I made this wreath in 2010 from an idea in Quilting Arts Magazine. It is silk flowers, taken apart and layered on Timtex and a backing, quilted, edges finished and bling added." "Attached is a photo of my submission for your bling challenge! I added Swarovski crystals to my latest quilt label, using my new Kandi's Professional Touch Rhinestone Applicator. It worked fabulously! Thanks for the inspiration!" 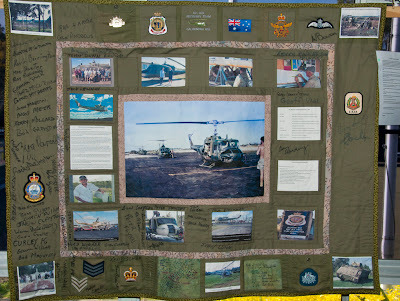 "One Hell of a Huey"
"My “Bling My Thing” quilt is a commemorative quilt which I made to commemorate the dedication of a helicopter used by the Royal Australian Air Force in the Battle of Long Tan (during the Vietnam War), which was used for re-supply of ammunition in that particular battle). Our local Caloundra RSL (Returned Services League) of Australia (like an Amvets Post or Veteran of Foreign War club in the USA – in other words, an Australia-wide Club for returned ex-servicepeople, currently serving military and their families) was able to locate one of the two Iriquois helicopters that were used in that particular battle. This helicopter was owned and displayed by the Bogan Shire Council (in New South Wales, Australia). On condition of a replacement Iriquois helicopter being found (and in good condition) that Shire Council agreed to an exchange of aircraft. Some three years after that agreement, $50 000 later (for the repair work to be done on both aircraft and paid for by the Caloundra RSL Sub-Branch) and 5 000 man hours (to repair the A2 10-22 helicopter used in the Battle of Long Tan, then to repair the donated helicopter to be given to Bogan Shire Council in exchange for A2 10-22), the A2 10-22 helicopter was installed at the Caloundra RSL Sub-Branch in its Memorial Garden, on March 16 this year. My husband who is the Sub-Branch President asked me to make the quilt, initially to raffle to raise funds for the continued maintenance of the helicopter, with just over 3 weeks to make the quilt. However, upon seeing (the almost finished quilt, with just one border left to be sewn on) he decided that the quilt had to stay in the Sub-Branch as it was (as stated by others) a fitting tribute to the men who died in the Battle of Long Tan, those who served in the actual Air Force squadron – 9 Squadron – in that battle, and those Australian Army men who fought in that battle, from D Company, 6 Royal Australian Regiment and those men who had worked to restore the quilt. Many of those men have signed the left-hand and right-hand sides of the quilt, around the unit badges. The “bling” for me is the Rising Sun badge appears on all slouch hats worn by the Royal Australian Army and is a symbol of the Army. It is also an iconic Australian symbol. My dear husband actually sewed the Rising Sun on to the quilt, as I was running short of time to get the quilt finished. The other bling is the use of parts of actual Army and Air Force uniforms in the borders of the quilts, namely the pockets which appear in the top and bottom horizontal borders and also part of a sleeve with the epaulette still on it, on the bottom horizontal border. The comments that I have received from everyone so far is helping me to forget about all of the little mistakes I can see in the quilt (namely sewing differently shaped photos into blocks and other little things). When one is making a quilt for the military and ex-military, precision is a major factor!" Wow Bern...what a story! Thank you so much for sharing. Now...for the prize! I am still waiting to hear back from a couple of people about donating prizes. I have some here that I plan on adding to the prize. There is no judging so the winner will be chosen at random and I'm going to have someone not associated with the IHAN blog do the drawing. Can you wait until Monday to know what the prizes are or do you want me to just do the giveaway without the other prizes being added? You tell me! "I also like to add beads to my cards. This can be done by sewing them on individually or threading them onto a wire. All hand sewing and ornamentation must be done before adding the card stock to the back. To add beads on a wire I coil one end of the wire, thread the beads and then coil the other end"
Now that is what I call "made with love." Only someone who loved you a lot would make a birthday card like this....it is beautiful. Mary has a wonderful tutorial for making fabric post cards and if you click on the link above you can read the entire tutorial....it is excellent! 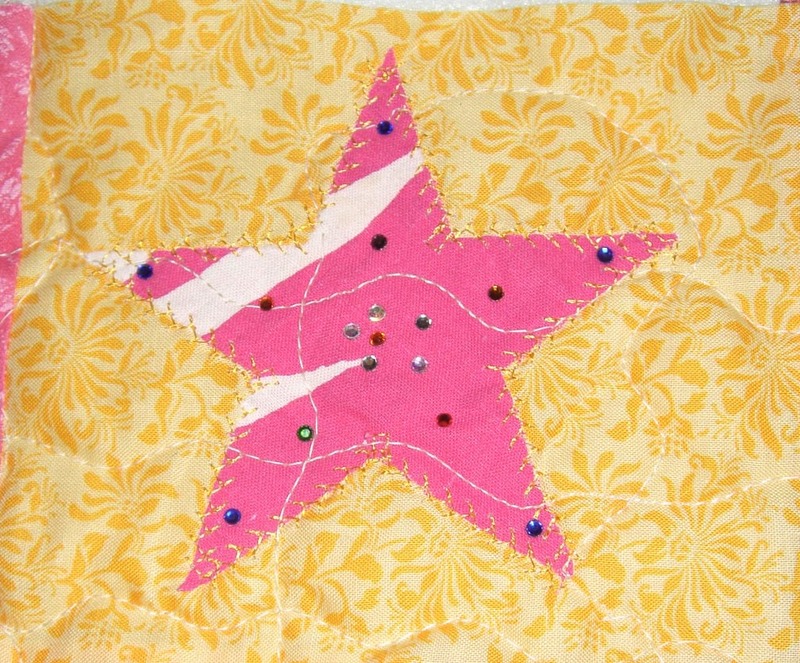 "I looked at the hanging and said "The star could use some sparkle!" So I sparkled it." "Then I pulled out a wall hanging that I started ....... err..... a while ago. It didn't have any real plan or goal in mind, so I have never rushed to finish it. No, it still isn't finished BUT, Kelly, at I Have a Notion, is having a little "Bling your Thing" photo sharing thing going. So I decided to add my bling to the wallhanging." 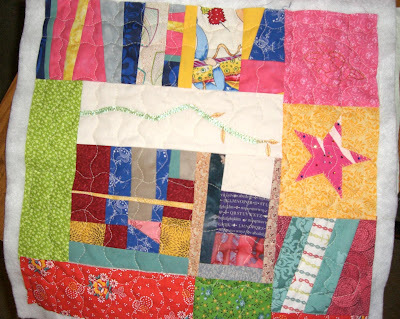 Gene.....you are one of the coolest quilters I know :) You have all sorts of projects and you never seem to slow down. Recently Gene has gotten into machine embroidery and his work is lovely. If you don't read Gene's blog on a regular basis, you may just want to click on the link above and visit Gene. He has a great sense of humor and a heart the size of Texas. "Brain Storm - Wool Challenge"
" Using #10 cotton thread in white, blue seed beads, and my trusty steel crochet hook, I made this little white Rosary case." " Here's the scalloped edge with the little loop closure in the middle." "Here it is standing upright and open, showing that it is just a simple pouch with the scalloped edge just a little higher than the plain edge, and both sides stitched together with single crochet." Mary wanted to know if her crochet Rosary Bag would count in the challenge. My reply? REALLY....when I say Bling Something - Anything....it all counts :) I'm so glad Mary shared her project because it is another beautiful creation and she has posted the tutorial on her blog. Click the link above for the tutorial. Your bag is so beautiful and delicate....what a treasure! OK folks.....you have until the end of the day to send me any Blinged Projects if you want to be in the Bling Your Thing challenge. Tomorrow I'll be posting a photo of the "prize" and of course, it will be drawn randomly. How about if we let Barb or Jocelyn do the drawing? It seems like everyone and their brother reads their blogs and trusts them. Will that work for y'all? My name is Zachary, I'm an IHAN co-worker. 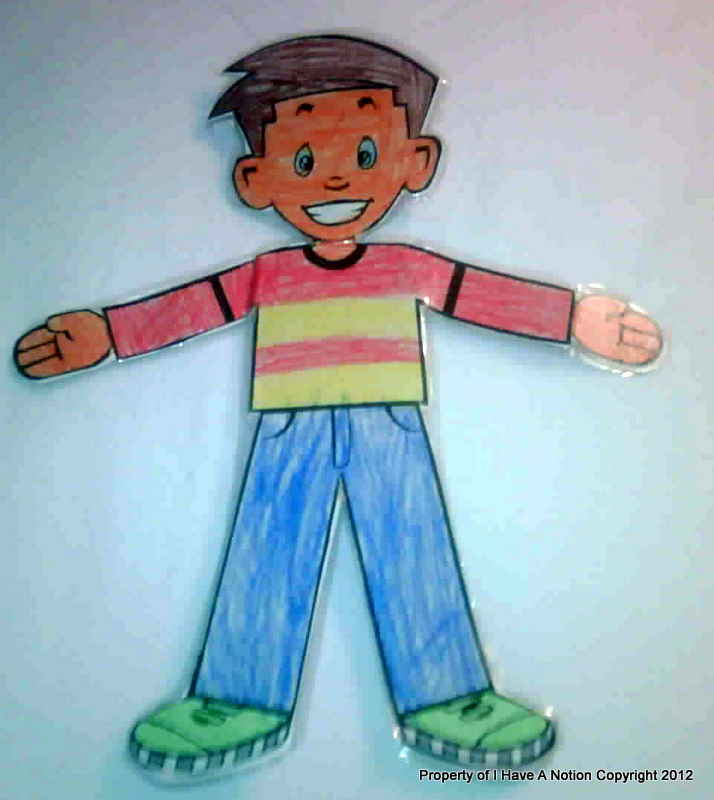 I have recently read a book about Flat Stanley. This is my Flat Stanley here in the photo above. I need some help traveling around....can you help me? Can you print him and take him to someplace interesting in your city or town and take a photo of yourself with him? When you are done visiting with Stanley can you please send me a letter (an e-mail will do) telling me about his trip to visit you? Thank you for helping me with my reading assignment. I need to take all my letters and photos back to school before May 15th. You can e-mail your letters and photos to my Mommy ( IHaveANotion@yahoo.com) and if you want to send me a real life letter, just ask my Momma for our address in your e-mail. I wanted to use something I already so I pulled out a gift I received from Nadine Ruggles during her Schoolhouse lecture at Quilt Market. She had given the attendees a little packet of fabric, beads and instructions to make an Inchie. I enjoyed her presentation so much and I've always wanted to make an Inchie....but I have not taken the time to make one until I came up with the "Bling Your Thing" challenge. 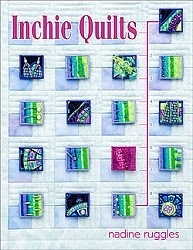 Nadine's book, Inchie Quilts is the perfect way to start doing some embellishing if you have not given yourself permission to play previously. This is the fabric Nadine supplied in the kit. Beads that were included in the kit. All I could think to do was to put the beads on the dots and then add some of the longer beads. It was so boring and I knew it needed something else. So I ran down and searched through my embellishments and found a package with these three little polymer turtles. They are not beads and don't have holes to stitch through. The minute I put the spotted turtle on the piece I knew it was the right thing to do. So I got a sharp needle and poked the needle and thread through this little fella and stitched him in place. While looking at the turtles the bright green one really appealed to me. But when he was sitting on the piece something wasn't right. That's when I got the idea to add some more bling. I plugged in my Kandi Corp Professional Touch Crystal Applicator . Lucky for me I had a package of Green 3mm Eye Kandi (that's what Kandi Corp calls their Crystals) and I started to randomly add "bling." I started with one crystal to see how it would look....I liked it so I just kept adding until it felt right to stop. I used a piece of thin batting behind the base fabric that I embellished. As you can see above, the embellishments held nicely and all my knots and excess beading thread was on the back. On the right is a piece of Floriani Stitch N Shape Double Sided Fusible that I had fused to a piece of plain fabric. I gently pressed the embellished top to the layer of Floriani Stitch N Shape. Next I did a stay stitch around the entire design and trimmed away the excess so I could see where the stitching would fall when I did the final stitching. I used Floriani Embroidery Thread because I love the sheen and this is what it looked like. As much as I tried to ship those little white threads around the edges, I couldn't snip close enough. Fabrico Fabric Marker to the rescue!!! My little slice of "turtledom" measures 2" x 2 1/2" and is by far the smallest thing I've ever stitched. I love how it turned out and have been thinking about what to do with it. Perhaps I'll make one 1/2 the size and embroider my name on it, then attach them with little hoops and use it as a name tag for my Machine Embroidery Guild meetings. Who knows? However....I did manage to "Bling Some-Thing" and I was quite surprised by how much fun I had. Sue Spurlock who was the inspiration for the "Bling Your Thing" challenge had sent me this beautiful doll. Her note reads, "Kelly, Your description of yourself inspired this." 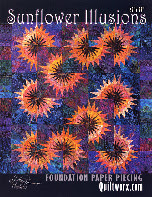 You may recall some of Sue's work is in the book, Creative Quilting with Beads. The book review is HERE. I had goose bumps...I'm in love with "Flies by Seat of Pants." THANK YOU SUE!!!! I think you pegged me dead center!